Active Directory is the central nervous system of any IT infrastructure. It controls access to nearly every critical resource and sensitive asset in an organization that users need to perform their daily tasks. Ongoing monitoring of Active Directory changes is essential for timely detection of any unauthorized changes made in this critical system and thereby for protecting the entire IT infrastructure. But continuous awareness about who changed what and when and where each change was made requires more than just a watchful eye and attention to detail. Due to the many limitations of native auditing capabilities, it can be difficult and time consuming to monitor Active Directory changes without better tools. Netwrix Auditor for Active Directory is a software solution for Active Directory monitoring that tracks all changes made in Active Directory and Group Policy. 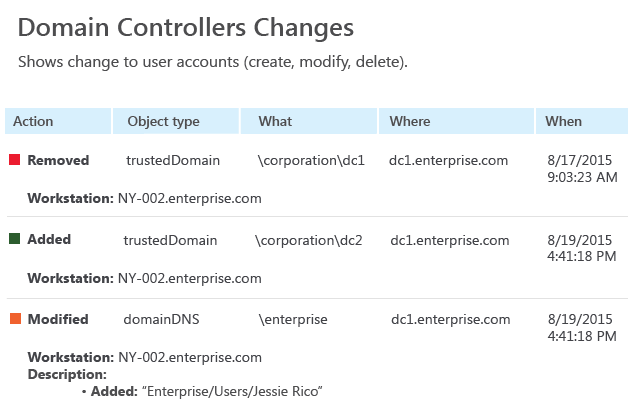 It enables AD administrators to easily generate Active Directory audit reports that show actionable data about who changed what and when and where each change was made. This detailed information is available for every change in Active Directory and Group Policy. Additionally, Netwrix Auditor for Active Directory provides "before" and "after" values for each object that has been modified. This detailed reporting on Group Policy and Active Directory changes eliminates the time and effort spent on collecting the same information manually or through complex scripting, and also augments the audit data with information that is simply not available in Windows event logs. Efficient auditing of Active Directory and Group Policy has become an absolute must-have for any organization. The ability to monitor Active Directory changes and review them on a daily basis enables quick detection of any inappropriate change, whether malicious or a simple mistake. Instead of reactively handling issues reported to the help desk or waiting for a data breach to be publicly announced, with the Active Directory monitoring tool from Netwrix, AD administrators can proactively identify emerging problems and respond to them promptly, minimizing the impact on business processes and user productivity.